Yes, we’ll be watching the big games this summer — and we think it’s pretty safe to say that gymnasts tend to have some of the most body strength for their size, even compared to other competitors. Out of the world’s greatest athletes, gymnasts boast what almost seems to be inhuman, incomprehensible strength. It’s truly impressive to watch them take the stage as they contort their bodies and show the tremendous control they have in moving them. And even if our kids never wind up as a world-class competitor, the strength benefits of practicing gymnastics will stick with them for a lifetime. Sadly, today’s children face the dangers of obesity at higher rates than ever before. Now is our chance to take a stand, making sure our kids receive the exercise they need to stay healthy. Gymnastics is a great outlet. While a lot of this exercise is going to build strength, training also develops cardiovascular endurance. Take a trampoline, for example. Training on a trampoline burns more calories in 30 minutes than running for the same interval. It’s good for the mind, heart, and body! Depending on their age, many children are still developing and improving their essential motor skills. 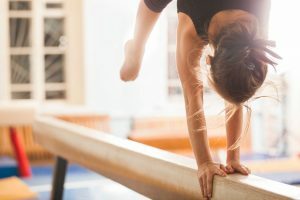 Thanks to the types of movements and skills practiced in gymnastics, kids who are enrolled in a program are most likely going to develop these abilities at an accelerated pace. According to the Mayo Clinic, “Better flexibility may improve your performance in physical activities or decrease your risk of injuries by helping your joints move through their full range of motion and enabling your muscles to work most effectively. Stretching also increases blood flow to the muscle.” That’s proof enough for us! The flexibility inherent to gymnastics is a key benefit for healthy development. Knowing that the benefits extend to mental development and success in school makes us take gymnastics even more seriously than before! Now is the time to get the kids started with this amazing sport. And one of the best tools for training is a large and bouncy backyard trampoline. Check out our selection and get your little ones tumbling today!